Welcome to the world of Paul Hoffman, Liberty Science Center impresario, writer, lapsed woodpusher, food entrepreneur, and occasional deep thinker. These days Paul says he is thinking about renegade robots, bad bishops, fried clams, drip coffee, con games, and teenage angst. He's deep into Rubik's Cubes (see his interviews with The New York Times and CNN) and he is on a mission to get New Jersey children excited about science and mathematics. The Moth posted a talk he gave about his difficulties with his father, and the Museum of Mathematics posted a lecture he gave about Paul Erdös and mathematical beauty. Hoffman is known for his long exploratory walks around New York City. The New York Times called him Mayor of Strange Places. 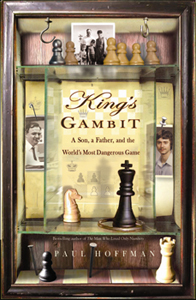 Long reviews of my memoir King's Gambit: A Son, a Father, and the World's Most Dangerous Game appeared in The New York Times Sunday Book Review and Chronogram. I've posted other interesting reviews here; King's Gambit was awarded an A- by Entertainment Weekly, three and half out of four stars by People, and kind words by grandmaster Andy Soltis in the New York Post.